At this time of year, at our latitude, we are below zero with the wind chill. Just past 5 o’clock, our sky dissolves to black. Now is not the time for frenetic noise-making or hyperbole as innumerable flakes fall, and the resultant blanket of white beckons one to lay down and let all things pass. What any scarred soul craves with a depth of snow on the ground and double-digit winds are sounds that reflect the rage in the surrounding atmosphere, not a chest-thumping or chest-stabbing, however much we may usually love such hymns as the Winter Solstice nears. The question is, where do we turn when we are choked by the forgettable output of most Metal men? As always, we look to the purveyors of the Black, and specifically, at this time of year we seek those who capture the gray of the heavens most competently, and where better to look than Moribund Records, who have been bringing us Hell for over twenty years? In anticipation of the bastardization of the true reason for the season by dogmatic propaganda, Australia’s Moon (one Miasmyr, all vocals and instruments) has set upon the altar a keyboard-heavy slab of depressive yet powerful Black Metal that stirs the soul and quickens the flesh within the same spectrum of tones found on any one of the excellent Evilfeast releases (which I highly recommend). Miasmyr allows the swimming guitars, the mixed-down yet martial drums, and epic-scale synths to fill the void in your holiday-stuffed heart, leaving just enough space for his croaking, omnipresent voice to pierce the frozen veil of unbelief the production creates. ‘Inhale Darkness’, driven by sauntering double-bass and (can it be? Yes it can) wah-ridden riff pulls you off your feet, into the tub, razor at the ready. ‘Poison From the Abyss’ toys with your emotions, starting with a brief major chord dying quickly into the minor on repeat, relieving you of any hope to be had as December slips it fingers around your spirit’s throat. 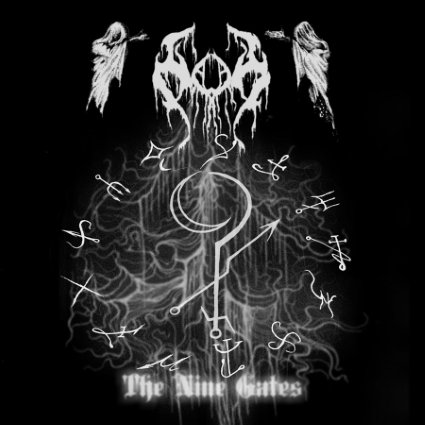 ‘Gate of the Moon’ twists riffs and atmospherics together until discernment between the two cannot be done, and all that’s left is the feeling of a slow descent into something darker, more evil and yet, more palatable to the warmth before or that is to come. ~ by cliftonium on December 11, 2013. Ah, finally some black metal I can get on board with! Dis belly good duder! This entry was posted on December 11, 2013 at 8:30 pm and is filed under ALL REVIEWS, M-reviews, Uncategorized.You can follow any responses to this entry through the RSS 2.0 feed.You can leave a response, or trackback from your own site.